Terre Haute, IN residents Frank Deardurff III & Bret Ridgway recently signed a publishing deal with New York publishing house Morgan James. 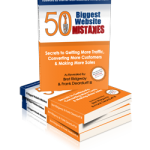 Their book “50 Biggest Website Mistakes – Secrets to Getting More Traffic, Converting More Customers & Making More Sales”, previously self-published, found the attention of Morgan James and was quickly signed to a publishing contract. Since then, Deardurff & Ridgway’s book can be found at most every online bookstore such as Amazon and Barnes & Noble. Their book is also available for mobile reading devices like iPad, iPhone, Kindle and the Nook. The book was written to help people get more success out of their website and online business. The information comes from the combined efforts of Frank Deardurff III and Bret Ridgway (both living in Terre Haute, Indiana) who together have well over 25 years of online marketing experience and have an established presence in the online marketing community. 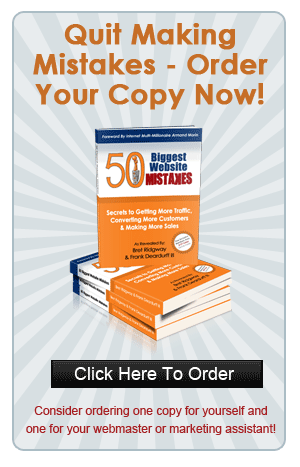 In an excerpt from the foreward Internet multi-millionaire Armand Morin best describes the book as saying “In their book, “The 50 Biggest Mistakes We See Online Business Owners Make”, Bret Ridgway and Frank Deardurff have taken the guess work out of it. They show you specific examples of what TO DO and what NOT TO DO. Bret Ridgway is co-founder of Speaker Fulfillment Services, a product duplication and fulfillment house located on Hunt Road in Terre Haute is also the author of several other business books, including a similarly titled “50 Biggest Mistakes I See Information Marketers Make”. Bret and his wife Karen have 3 children and live on the east side of Terre Haute. Frank Deardurff III is co-founder of Access Cafe Networks (a network consulting and web development company) and founder of Orange Pixel Inc. (Web solutions & information for today’s entrepreneurs), which is located in downtown Terre Haute at 6th & Ohio. Frank and his wife Sharon are parents (and grandparents) of two and live on Terre Haute’s south side.